GUN nuts in the US state of Virginia have been warned not to fire their weapons at Hurricane Florence. The warning came after a Facebook event called "shooting guns at Hurricane Florence to scare it away" went viral, The Sun reported. Although started by an online prankster, the event has received an overwhelming response and is due to begin later today and last for 24 hours. The event, hosted by Ryan Stumpf, has now reached 22,000 people "going", and 55,000 people "interested". But the enthusiastic response to the event left organisers worried that it might not be taken as a joke. The details state: "Get your guns and your umbrellas. 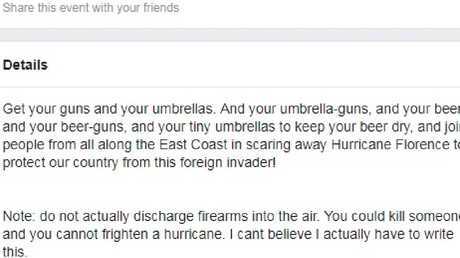 And your umbrella-guns, and your beer, and your beer-guns, and your tiny umbrellas to keep your beer dry, and join people from all along the East Coast in scaring away Hurricane Florence to protect our country from this foreign invader! "Note: Do not actually discharge firearms into the air. You could kill someone and you cannot frighten a hurricane. I can't believe I actually have to write this." It was made as a joke which managed to dupe cops. The event has echoes of a similar instance during Hurricane Irma last year which actually prompted police to issue a warning. That Facebook event was made by "patriots" and said its purpose was to shoot their guns at the hurricane to scare it away. The responses went viral, with 26,000 people clicking "attend", and 45,000 clicking "interested". Pasco Sheriff warns residents not to fire at the hurricane. 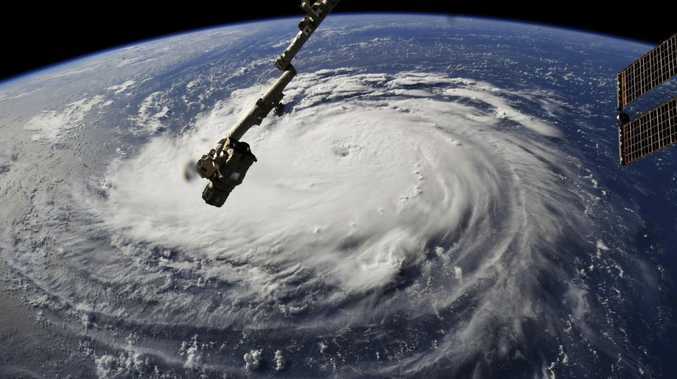 Hurricane Florence is currently powering its way towards the US east coast, with more than a million coastal residents already having been ordered to leave their homes and emergencies already declared in North and South Carolina, Virginia and Maryland. The hurricane is expected to make landfall at 8pm Thursday local time (10am Friday AEST). 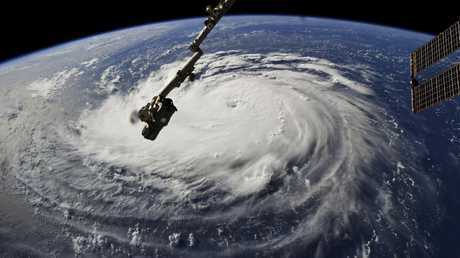 This photo provided by NASA shows Hurricane Florence from the International Space Station on Monday, September 10, 2018, as it threatens the US. East Coast. The move was seen as a precautionary measure as navy ships survive better in rough seas rather than being moored in port where they could be damaged against piers. The storm's first effects were already being felt on barrier islands as dangerous rip currents hit beaches and seawater flowed over a state highway. 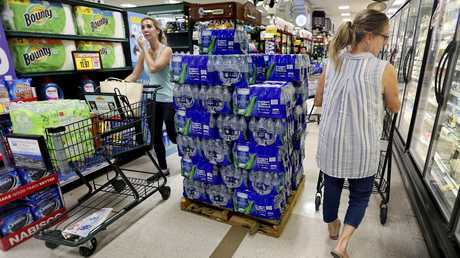 Shoppers in South Carolina stock up on supplies as Hurricane Florence approaches. 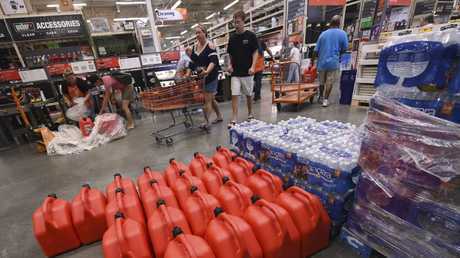 Americans buy supplies at The Home Depot before the hurricane hits. 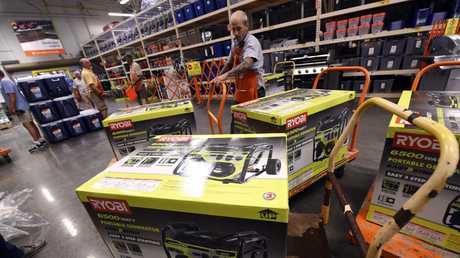 Home Depot employee prepares more generators for sale. 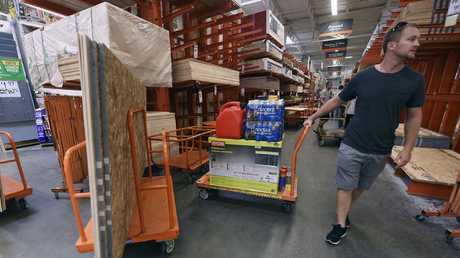 Shoppers stock up on home supplies ahead of Hurricane Florence’s arrival. Meanwhile, US President Donald Trump tweeted saying the government is on standby. He said: "Just had calls with South Carolina Governor Henry McMaster, North Carolina Governor Roy Cooper, and Virginia Governor Ralph Northam regarding the incoming storm. Federal Government stands by, ready to assist 24/7." The state's emergency management agency said it is "preparing for the possibility of a large-scale disaster". Myrtle Beach Mayor Brenda Bethune urged people to secure their homes but said it's too early to know if evacuations will be ordered. President Trump tweeted this morning: "Please be prepared, be careful and be SAFE!" The devastation brought by Florence is expected to be the worst since Hurricane Hazel struck in 1954 when it's estimated around 1000 people lost their lives, with 95 of those in the US. This story originally appeared in The Sun and was reproduced here with permission.